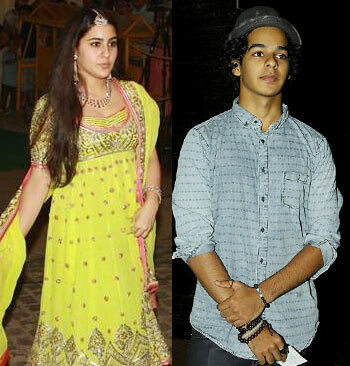 If reliable sources are to be believed, Amrita Singh and Saif Ali Khan’s daughter Sara will be launched opposite Shahid Kapoor’s brother Ishaan in an unusual love story. The film will be produced by Karan Johar. "It is not enough anymore to make a boy-meets-girl launch pad for two star kids," says a source. "The launch vehicle has to be an out-of-the-box showcase to accentuate the debutants’ personalities. Sara and Ishaan are ready. The script is being worked upon." Both Sara and Ishaan have harboured acting ambitions from the time they saw stars blossoming in their homes. Sara, who has graduated from Colombia University, grew up watching her parents head off to shootings everyday. Ishaan considers his brother Shahid a hero. Shahid, in fact, takes a keen interest in his kid-brother’s diet, physique and grooming. But both star children are open to other career options. "They are not looking at acting as their first and last career option,” says the source. Meanwhile, Sridevi and Boney Kapoor’s daughter Jahnvi has turned down Karan Johar, Yash Raj Films and several other production houses. Apparently, the young woman is considering various career options.